This was sent to me by Caoimhe who is mum to Lorcan who has type 1 diabetes . The support and information for parents and professionals about breastfeeding a baby who has diabetes is very poor, as you will see in the piece below . Lorcan has just weaned in the last few weeks at the grand age of 2 years and 4 months. This is due to Caoimhe’s wonderful determination to listen to her gut instinct . Breastfeeding is the norm for babies, mothers should not have to defend it. Lorcan : the day after he was diagnosed with Type 1 Diabetes. Breastfeeding a baby or infant with type 1 diabetes is not an issue….or at least it shouldn’t be. But in my experience, the issue is lack of knowledge about and experience of breastfeeding from hospital staff (consultants, doctors and dieticians). Lorcan was 13 months old and breastfed when he was diagnosed. There is a history of type 1 diabetes in my family so it was just bad luck on his part that he got it. Apparently people who get type 1 are born with a defective 6th chromosome (according to new genetics research that was published in Time magazine recently). Initially the fact that Lorcan was breastfed wasn’t an issue. 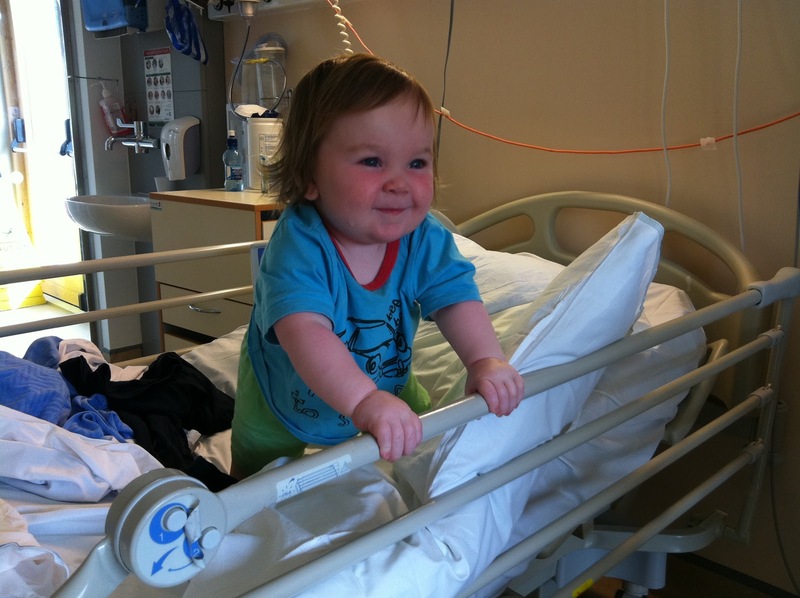 The priority once he was admitted to the childrens hospital was to stabilise him. His blood sugar level was very high and he had ketones in his blood – meaning that because his pancreas wasn’t producing insulin and converting the sugar to energy, his body had started to convert fat to energy. The ketone smell of his breath was what caused alarm bells to ring for me – as soon as I got it I just knew he had diabetes. We were in A and E for around 10 hours, with Lorcan hooked up to various drips and subjected to serveral examinations and tests. I lost count of the number of different hospital staff who saw him during that time but the one abiding memory I have is that every time someone new came into the room you’d hear “He’s a breastfed baby! !” being shouted at them loud and clear. So it was obvious that breastfed babies are the exception rather than the rule. We were eventually moved to a room and ended up staying in for 2 days, during which we had to learn how to give Lorcan insulin injections, check his blood sugar and ketones, how to manage his diet, and how to deal with hypos (low blood sugar). It was a huge learning curve for us and we were terrified when we got home, but we managed. We had to give Lorcan 2 injections a day, one before breakfast and one before dinner. And we had to ensure that Lorcan ate at set times – breakfast, mid morning snack, lunch, afternoon snack, dinner and supper. This was because the various insulins that he got in his injections would peak at certain times of the day,so he had to have food at those times to avoid having a hypo (blood sugar level dropping below 5). Not much was said by hospital staff about breastfeeding while Lorcan was on injections, we were just told it would be best to feed him at mealtimes rather than on demand. At every hospital appointment I would be asked if I was STILL breastfeeding him, and how many times I fed him during the night and stupid questions like how much did I think he was getting (it was consultants and doctors who asked,not the nurses who were always more supportive). At no point did anyone suggest that me continuing to breastfeed was a positive thing – at least I instinctively felt it was the best thing for him. I often came away feeling like me continuing to breastfeed Lorcan was an inconvenience and that weaning him would be better for him. During one particular visit, a consultant asked me if I was still feeding Lorcan during the night and when I replied that I wasn’t feeding him that much during the night she said something along the lines of “oh well that’s good”. I know I was probably being over sensitive, but the comment really undermined my confidence and caused me to doubt if breastfeeding Lorcan was really the best thing for him. So I phoned Sue Jameson IBCLC and had a chat and she gave me the moral support I needed and reassured me that my own instinct about breastfeeding Lorcan was right. Breastmilk is the most optimal food for an infant, it’s easily digested and has all sorts of immunological benefits, so I decided I’d carry on. I did ring one of the nurses in the diabetes clinic though and tell her how I was feeling after the appointment with the consultant and the general lack of breastfeeding support. Lorcan got an insulin pump in June. What this means is no more injections, not having to stick to a rigid mealtime schedule, greater freedom for Lorcan, a more normal life, better control of his blood sugar and overall beter longterm health. With the pump we carb count. The pump gives him background insulin 24 hours a day, but when he eats, we calculate the amount of carbohydrate in the food and give him the correct amount of insulin via the pump to convert that carbohydrate to energy. This involves either weighing food or looks at the carb content on the packaging, or referring to our ‘Carbs and Cals’ book. Eg a small banana contains 15g of carbohydrate. Lorcan’s insulin to carb ratio is 1:40, so for 15g of carbs he needs 0.35 units of insulin. It sounds complicated but it was just a matter of learning about the carbohydrate content of food and calculating how much insulin is required. The training that we did through the hospital was quite comprehensive. In addition to doing exercises and reading at home, I met with the dietician….and of course the subject of breastfeeding came up. She compared the carb content of breastmilk to formula (7g per 100ml breastmilk and around 9g per 100ml of formula), and asked me how I thought I would be able to calculate how many carbs Lorcan would be getting per brestfeed. I honestly didn’t know what to say. How on earth would I know how many mls of milk Lorcan was getting per feed? I felt she knew absolutely nothing about breastfeeding other than the fact that breastmilk contains 7g of carbs per 100ml. I came away from that meeting again feeling that me breastfeeding Lorcan was an inconvenience for the staff, but also felt determined that I would find a way of managing breastfeeding and Lorcan being on a pump. And I did. I knew Lorcan was not getting huge amounts of millk per feed,possibly 20 – 30ml (2g carbs) and so the effect it would have on his blood sugar level would be negligible (to put that amount in perspective, Lorcan would normally consume 50 – 60g of carbs at dinner time). Anytime he had a really big feed I gave a tiny extra bolus of insulin through the pump. But on the whole, what my experience told me was that because of his age and the duration and frequency of feeds the effect on his blood sugar level was so small as to not require extra insulin. I know it would be different for an exclusively breastfed baby on a pump, but it is doable! Just a matter of getting a feel for how much the baby has per feed and working out what the appropriate amount of insulin is for it. Feeding the baby formula probably is easier, and more ‘scientific’ as you can work out to the exact ml the amount of milk the baby has consumed. But I really feel that breastmilk is infinitely better for a baby with type 1 diabetes and that all effort should be made to support the mother in breastfeeding. However, the unfortunate reality seems to be that formula milk is still considered the normal way to feed a baby by most medical professionals in Ireland.